Thank you, Al. It was our pleasure to help! Glad we could assist you! Thank you, James! It was great having you as a long term customer. It was our pleasure to help you! Tanya was super friendly and helpful! Thank you, Lindsey. I'm glad we were able to secure a trailer for you to complete your move. Tanya was very helpful, professional, and friendly. No complaints! Thank you for the kinds words. I'm glad I could help! I'm glad you were able to utilize the online system with ease! Thank you for choosing Bayou Storage and U-Haul. Thank you Sharon for your kind words. I'm glad I was able to accommodate your needs during this crazy busy moving weekend. Thank you, Keith. We think our customers are pretty awesome too! Excellent service it took 5 minutes in and out. Thank you! Glad we could get you in and out so quickly. Awesome young Lady who waited on us. She was very professional and very knowledgeable. I would recommend her and this location. Thank you, John for your kind words (and for calling me young :-) ). It was my pleasure to assist you and your wife. Thank you, Kelly. It was my pleasure to assist you in your move. I think you are doing a great job! Keep it up! Thank you Justin. Your kind words are appreciated. Clean and well maintained U-Haul equipment. Thank you Michael. I'm glad we had the pick up truck available to assist your needs. Yes very nice people and helpful. Thank you, Dominique. Glad we could assist you! Two Great young ladies gave me the Best customer service I've had my whole stay here in Lake Charles! Thank you for the kind words, Dominique. I'm glad we were able to accommodate your vehicle needs. The young lady that took care of me was exceptional. She even cut her lunch break short to accommodate my needs. Professional does not even begin to describe the service at this location. I will certainly recommend this location and use it again in the future. Thank you for the kind words. We were happy to help you. We originally booked a larger trailer on line 2 weeks ahead of time. 2 days before we needed it the facility on hwy 14 said it was not available and could not get us one. We had 1 day to move. Thank you to Bayou storage for their help! Will never book with uhaul on line again. I sorry you had to deal with that mix up, but I'm glad I had something that worked for your move. A little difficult to find but worth the effort. The rep did a fantastic job. I liked renting from this location. I'm sorry you had difficulty finding our facility. It's a very long driveway :-) I am glad once you found us, you were pleased with your experience. Last minute looking for a truck to haul furniture in a Sunday !! Tanya not only took my number but called me with a van 15 minutes before closing !!! She held over for me and gave me a clean, and very nice van !!! She went way beyond what someone else would have done !! Very personable and I liked that !! Thank you, Carol. It was my pleasure to be able to help you. I'm glad we were able to get you in a van to take care of your moving needs. This location is the best. The employees are always courteous and informative. The only improvement would be availablity of more trucks. This tends to be a busy location. Thank you, Dianne. I too wish we had more rotational trucks at our lot. Maybe one day we will. But in the meantime, I can always try to find a piece of equipment at a different location for you so you aren't having to drive or call around to other locations trying to find what you need. Thank you, Eric. It was a pleasure helping you. The girls were very friendly and helpful! Thank you, Timothy. The pleasure was ours! UHaul equipment was clean and well maintained. Thank you Raymond, it was a pleasure to be able to assist you. It was a great experience. I'd do this again if I needed a van to move things. 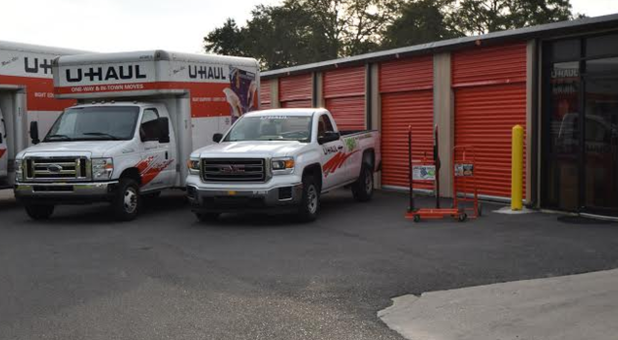 Thank you for choosing Bayou Storage and U-Haul. Goes above and beyond to help you great place. Thank you for your kind words. It was my pleasure to assist you. Thank you. I look forward to helping you again! Thank you, Deirdre. It's always a pleasure seeing you. Thank you Sandra. Glad we could assist in the move! Glad we could assist you in your packing needs! Tanya is great and will go above and beyond to help all your needs. Thank you Ilya. Your business is greatly appreciated! Great job! I have been a customer for 2 years or longer. The staff here at Bayou Storage have been most gracious and helpful to me. Again great job and Thank you very much. Thank you Levence. We appreciate your business! Some of the nicest staff members I've ever met. Transactions were fast and friendly. Would definitely recommend! Thank you Tram. I'm glad we could meet your expectations. Very friendly people and work very fast. Couldn't have had a better experience!! Thank you so much. We are glad you had a great experience. We look forward to working with you again! Unbelievable great service from Tanya today, above and beyond! Thank you for locating what I need. Thank you Steve for your kind words. I look forward to helping you reserve the trailer every 3rd Sunday of the month! I personally did not meet Tanya, but she contacted me via text and was extremely helpful. Thank you for your kind words. I'm glad I could help! The U-Haul equipment was clean and well maintained! Thank you for your review. We pride ourselves in having the cleanest U-Haul equipment around! Glad to be able to assist you in your move. Thank you...It's easy to be great when we have great customers! Thank you! I'm glad we can meet your expectations! Thank you, Patrice for your kind words. We take pride in hand scrubbing the rooms to make sure it is freshly cleaned for our new customers. Attendant was very personable and very helpful. If needing to rent again in future will definitely consider using again. Thank you for your kind words. We appreciate your business and look forward to helping you again. I loved that I could drop my equipment off here even when the location was closed. Super convenient. I'm happy we were able to accommodate your needs. Thank you for choosing Bayou Storage. Thank you for stopping in. We appreciate your business! The prices are really cool!!!!!!! Thank you for review. We do our best to provide a clean and safe facility to store your possessions without a large price tag attached. I cannot say enough about the staff at this UHaul. We will only lease from here. The location is convenient and even if it was across town, we would drive there only. Most helpful, always pleasant, and a delight to work with. Thank you for the kind words. It's always a pleasure to see you! Always most helpful. I don't go to any other UHaul location!! Becky had great customer service. She was very spunky and energetic. Becky had great customer service. She updated my pick up time. Michael, thank you for you kind words. We appreciate your business! This transaction went very well. All services were great. Thank you to those who were so helpful, both in Lk Charles, LA , and in Winnsboro, TX. We are glad to hear your move went smoothly! Love this place!! Very accommodating and helpful. We don't go anywhere else!! The lady we dealt with was exceedingly friendly. very professional and tremendously helpful. I would very much like to recommend this location to everyone. She was very nice and accomodating. Great service. This storage facility is amazing!